All iPhone models have a built-in GPS device which aids in navigation and allows for pin-point precision for location detection. 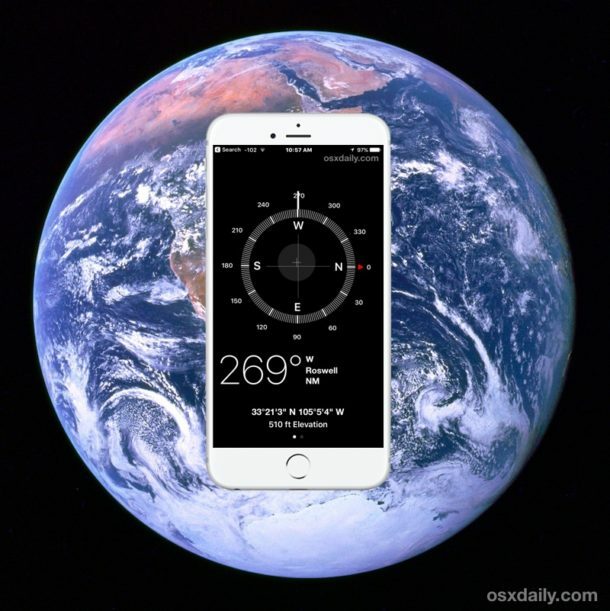 While most users who interact with location and navigation features on their iPhone will be using the Maps applications, it can also be helpful to get exact GPS coordinates for latitude and longitude, perhaps for placing into a dedicated GPS tracker or for finding particular coordinates for a location on a map. We’ll show you how to retrieve and display GPS coordinates on iPhone using native applications, there are no third party apps or downloads required. Before we begin, some of you are probably wondering why anyone cares about GPS coordinates when the iPhone has directions capabilities and a Maps application. It’s not relevant to everyone, but knowing precise GPS coordinates can be helpful for runners, joggers, skiers and snowboarders, explorers, hikers, geocaching (cheating! ), geologists, archeologists, realtors, surveyors, photographers, investigators, spies, and many other hobbies and professions. 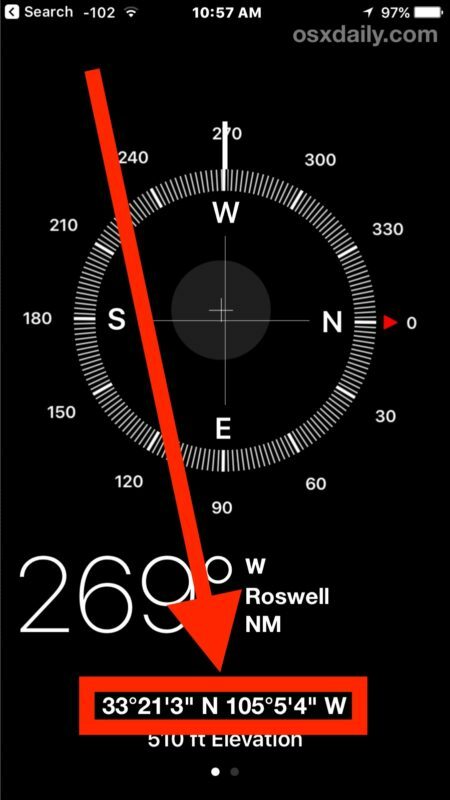 You can either copy the coordinates and paste them elsewhere, into Notes app, a message, email, or otherwise, or take a screenshot of the iPhone display to preserve the coordinates. You can also paste the copied or jotted down GPS coordinates into a Maps application to create a pin or see it on a map. If you save the spot and put it into a Maps app, you can also then later share a Maps location from the Mac or iPhone easily. The Compass app does not have a “Save Coordinates” or “Share Coordinates” feature currently, but perhaps a future version will have a possible log option or sharing features. If you do want to share where you currently are with someone else you can share your current location using Messages on iPhone however. Note this trick shows you the exact GPS coordinates of a current location on iPhone, but you can also get GPS geolocation data from iPhone photos as described here assuming the person taking the picture didn’t disable GPS geotagging on iPhone camera (which we generally recommend for privacy purposes). GPS metadata stored in pictures allows interested users to track down precisely where an image was taken, this can be done on the iPhone, iPad, Mac, PC, or even web browsers. For example, using Preview and Maps app on Mac you can see the exact location a picture was taken easily, assuming the person who took the picture did not disable geotagging of their images. Generally speaking, I personally recommend disabling geotagging of photos taken with iPhone camera, primarily as a privacy and security mechanism since many pictures are shared online nowadays. Do you really want to post a picture to social media or elsewhere on the internet and have someone be able to track down immediately and easily exactly where you are located or where the picture was taken? Some users may not mind that, but personally I’d rather default to having some degree of privacy and instead opt to include or share geographic location data at my own discretion, but maybe I’m a square. 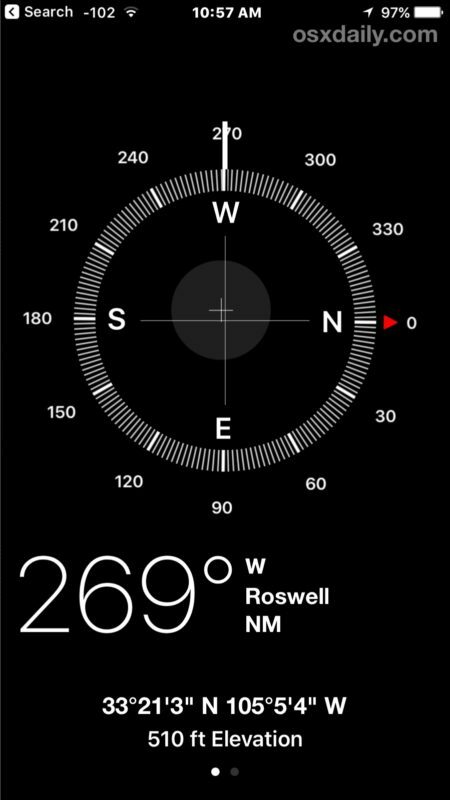 Speaking of GPS coordinates and your iPhone, if you are trying to track down a location it can be helpful to lock the compass needle position in the same iPhone Compass app. Have any other interesting GPS tricks for iPhone? Let us know in the comments. Any way to get the coördinates in D MM.MMM form? Get a “Theodolite” App, works in conjunction with your iPhone Camera. Great for Hiking, Hunting, Camping, Caching and anything else you can think of. Works even better with a “Dual XGPS150” Differential GPS Receiver. Accuracy is Measured in Inches, NOT Meters. It would take a programmer 15 minutes to create a Preference for the coordinate format, but nope. This is quintessential Apple; build a headquarters to house tens of thousands of employees but fail to do the simplest thing properly. This is a terrific feature, but would it be possible for the device to return coordinates in the very useful UTM format as well as degrees, minutes, etc? Instead of tap-and-hold to copy GPS coords, just do a tap to open the spot in Maps. From here you can get info on the current location including Lat/Long, drop pin, share with other apps, etc. I can’t get this on my iPhone 5 or at least it never shows no matter what I do. Can I get some help with this? Nor does it work on an iPhone SE. Consider using a free iOS app, myLocation, for even greater precision and ease. myLocation makes it easy to share a precise location – either current, or another selected location. Links and maps can be easily shared. Absurd! – the lower part is constantly covered by a Google ad and the coordinates are not visible. Compass app is on your iPhone, it shows the coordinates, there are no ads because it is not the web. There are no donuts in the app either! I can’t believe no donuts in my Compass app!! The compass on my iPhone 5 seems to be locked on 359 degrees. I can’t figure out how to release it so it searches for north once again. Anyone have a fix? You can get the coordinates in mm.mmm format in Apple’s Notes App. Save a Place as a Note in Maps and Go to the Notes App. You can use the GPS Coordinates Finder app for iphone and android devices to get coordinates information in different formats and also share easily. Besides your current location you can click any point on the map and get coordinates for that location. Anyway to increase accuracy? Just tested copying and pasting my coordinates into Google Maps to compare my actual location to the phone’s location, and it is off by 100’±. any idea what base datum is used for the coordinates? NAD27? WGS84? I lost my iPhone up on the mountain. It’s buried in the snow. I can see it on a map when I log into find my phone. How can I get the gps coordinates of the lost phone so I can use my friends phone to track to it?